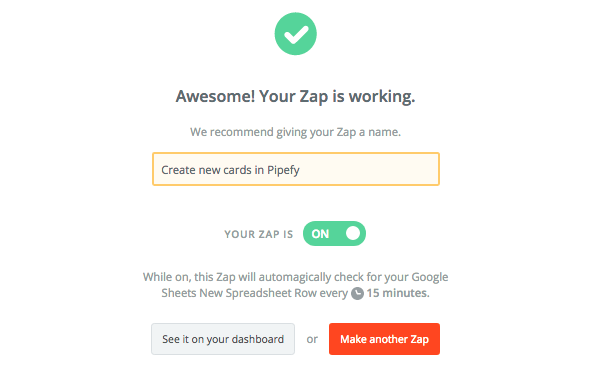 Zapier allows you to integrate Pipefy with over a thousand web applications, one of them is Google Sheets. Zapier works as a trigger – action system. Today, Google Sheets will be the trigger and Pipefy will be the action. In order to show you how it works, we'll use a basic example. The scenario is simple: we want to import customer data, which we have stored in a spreadsheet, into our Sales Pipeline on Pipefy. Cards are normally created by filling out a pipe's form. 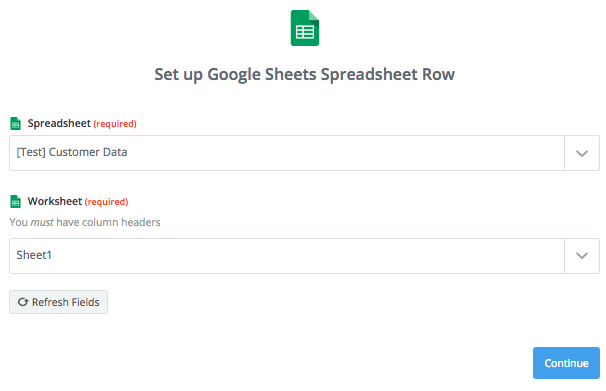 After we set up this integration, every time a new row is added to the spreadsheet in your Google Sheets account, a new card will be created automatically. 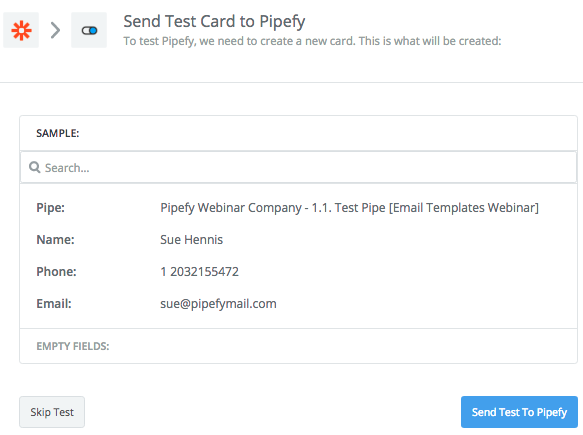 You can also use this integration to mass upload cards into a pipe. Even though integrating Pipefy to Google Sheets via Zapier is super simple, it'll require some attention to the details when setting up. Over the course of this article, we’ll teach you all about getting this integration up and running without any problems in 2 simple steps. This integration works by getting the information from your rows in the spreadsheet and adding it to the fields in your pipe's form. The first step for setting up this integration, therefore, is making sure the columns in the spreadsheet can be properly matched to your start form's fields (pay special attention to field types that require format validation, such as email). 1. Use the first row in your spreadsheet to indicate the name of the field that information will be matched to. Eg. 'customer name', 'phone number', 'email', etc. 2. Fill in one a row with test data (we'll need that later when setting up the zap). 3. Once your zap is up and running, every time you add a new row, a new card will be created in a specific pipe. You can also mass upload cards by copying and pasting multiple rows at the same time. Attention: Check out the tips below before creating the zap to prevent some frequently made mistakes. 2. The zap will only add new cards when you add new rows to the end of the spreadsheet. Deleting or replacing rows, especially in the middle of data your Zap has already identified, can cause errors. 3. Make sure that the data you add to your sheet's cells can be inserted in the field types they'll be matched to. If you have an email field in your start form (format validation name@email.com), for example, and you match it to a column with the customer's name on your spreadsheet, you will hit an error. Once our spreadsheet is properly set up, it's time to create the zap. If you don't have a Zapier account yet, click here to learn everything you need to know to get started. 1. Create a new zap: In order to create a new Zap, click the orange ‘Make a Zap!’ button in the upper right corner of Zapier's header. 3. 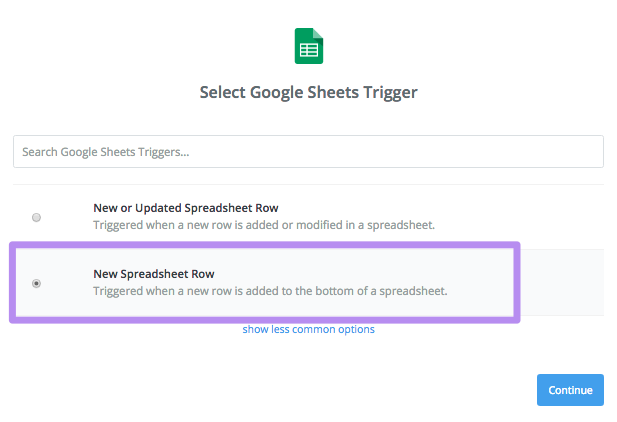 Select the trigger: For this integration, we'll select 'New spreadsheet row'. 4. 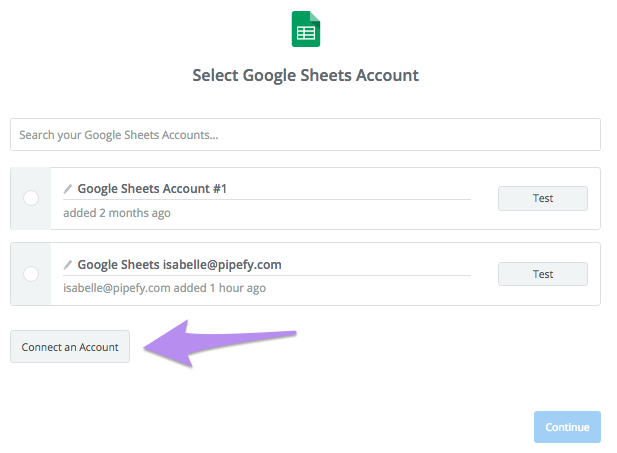 Connect your Google Sheets account: If you have already connected your account, select it from the list. If you haven't connected it yet, click 'Connect a New Account'. You'll see a pop-up window from Google asking you to login to authorize the connection between your Google Sheets account and Zapier. 5. Select the spreadsheet/worksheet: The next step is selecting the spreadsheet (in our case [Test] Customer Data) and the worksheet (Sheet 1) you'll add the information to. 6. 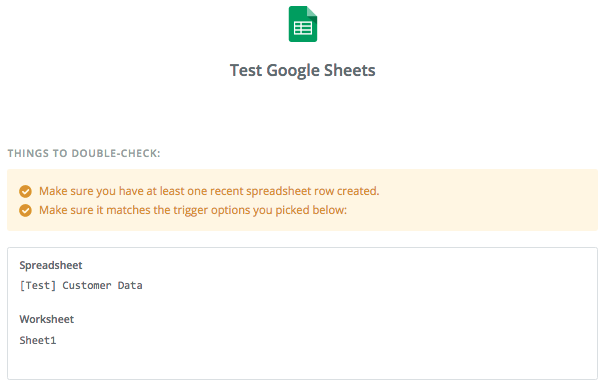 Test Google Sheets: Make sure you have at least one recently created spreadsheet row (we did this back there in step 1) and make sure it matches the spreadsheet and worksheet you selected in the previous steps. Click 'Fetch&Continue' to run the test. This step is done once you get a confirmation message. 7. Select the action app: We're done setting up our trigger, it's time to set up the action. The first step is selecting our action app: Pipefy. 8. Select action: After we do that, we'll select the action in Pipefy. In our example, it'll be 'Create Card'. 9. 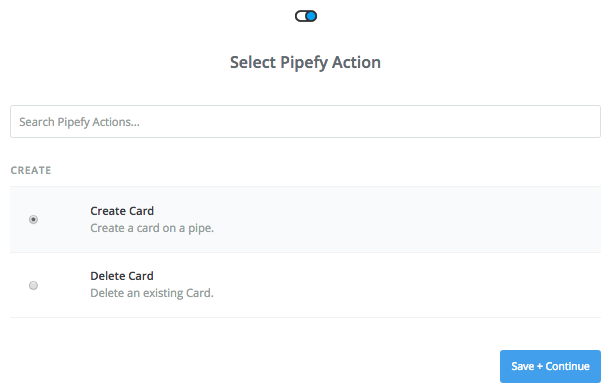 Connect your Pipefy Account: If you have already connected your account, select it from the list. If you haven't, click 'Connect a New Account' and follow the instructions. 10. 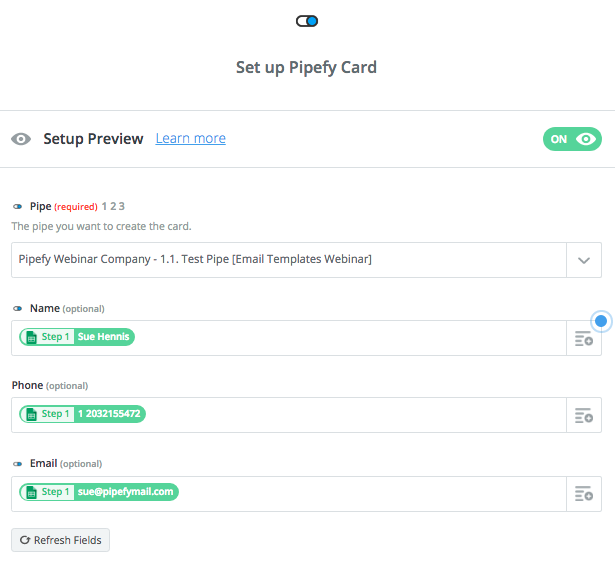 Setup the card: The first step is selecting which of your pipes you want the new cards to be created in. Then you'll match the fields in the form to the columns in your spreadsheet. In this case, make sure you have one worksheet with all your information, and a seperate worksheet (containing only the column titles and one row of data) for the integration with Pipefy. After editing the spreadsheet and creating the Zap, you can mass upload cards by copying rows from the original spreadsheet and pasting it in the other. Don't paste more than 100 rows at a time. All cards will be created in the first phase of the pipe.